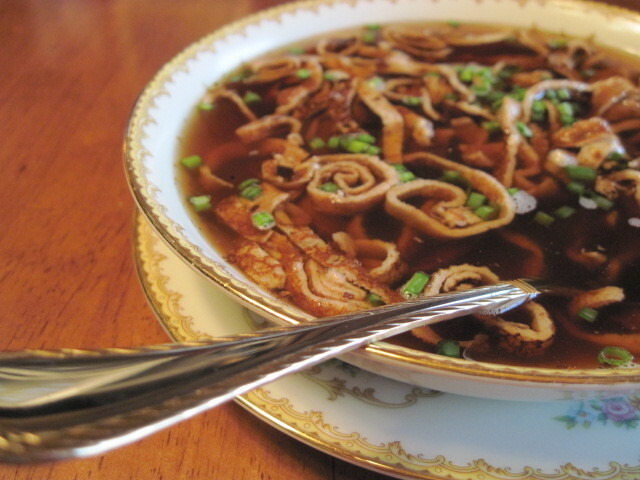 This dish takes me back to my childhood and the special occasions that my grandpa would make a soup he would call “Pan-A-Cake” soup in his heavy German accent. This is not his specific recipe but I do believe it’s very close to what he made in his own kitchen so many, many years ago. This recipe serves 15-20 people easily. Cut back on the measurements if your serving a smaller group. -Mix together flour, eggs and salt in a large bowl. -Gradually add the milk and nutmeg, stirring all the time until smooth. 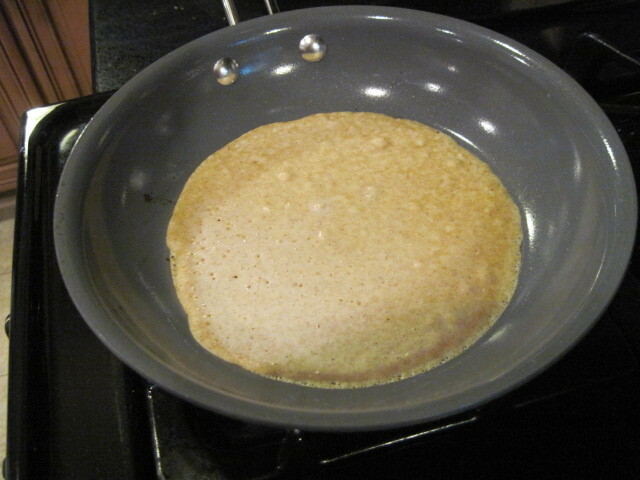 This mixture needs to be quite thin as you will be making crepe like pancakes and the batter needs to easily roll quickly around the bottom of a heavy non-stick skillet. 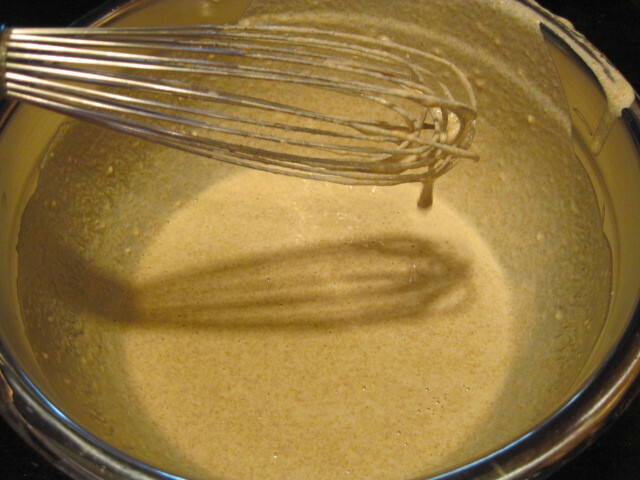 Add additional milk to thin the batter if needed. -Heat a heavy non-stick skillet over medium high heat. -Pour a small ladle full of batter in the middle of the pan and move the pan swiftly until the batter covers the bottom of the pan. -Flip or turn your flaedel once the bottom is golden brown. -Continue making flaedes until all the batter is used and cool them completely. 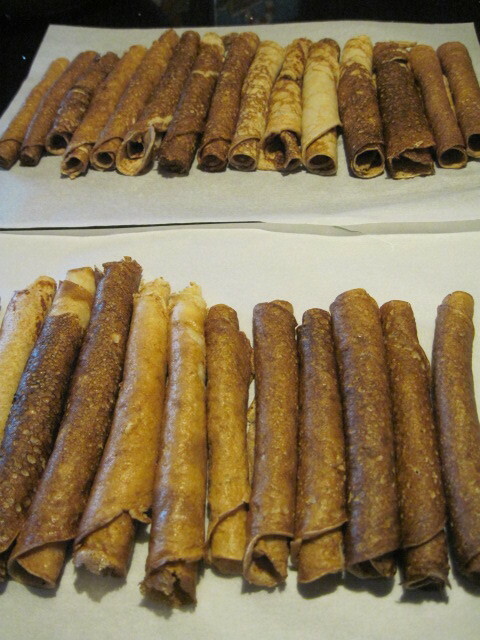 -Once your pancakes are completely cooled, roll them up into cigar shapes and slice each pancake into thin strips. -They are now ready to add to your hot beef stock* (See the following recipe) or you can use good quality store bought stock if desired. Very important: Do not put the hot pancakes into your hot stock as they will fall to pieces and form a gooey mess. 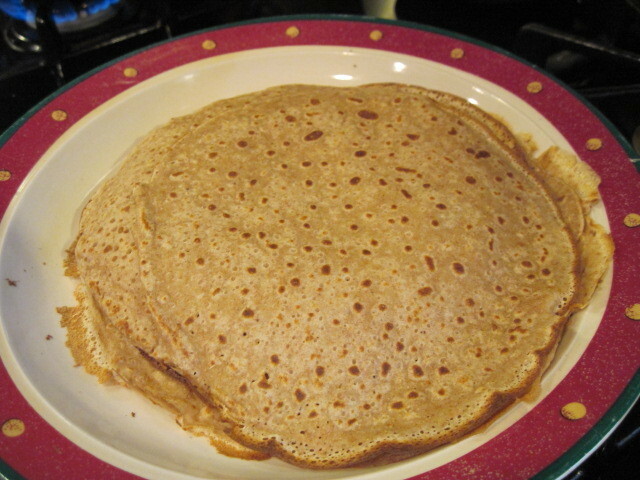 –You can also freeze your cut pancakes as they hold up beautifully in a zip lock bag. This is a perfect dish for entertaining as everything can be made in advance, frozen and assembled easily on the day of your event. 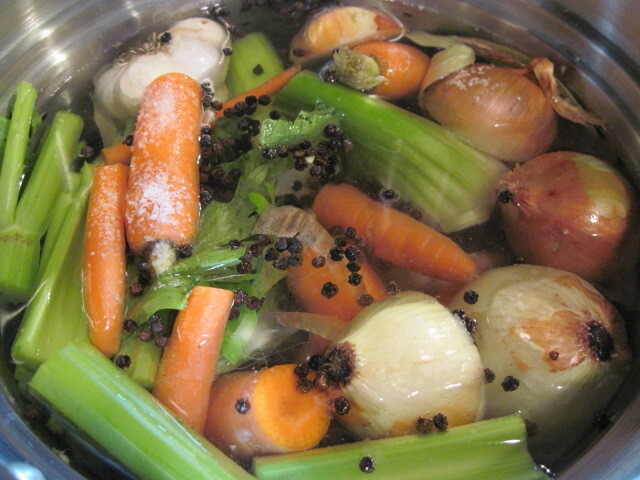 Add the following ingredients into a large stock pot, cover with water and simmer on low for a good 5 or six hours. The longer the better. 4 large beef bones, roasted in an 400 degree oven for 1 hour. 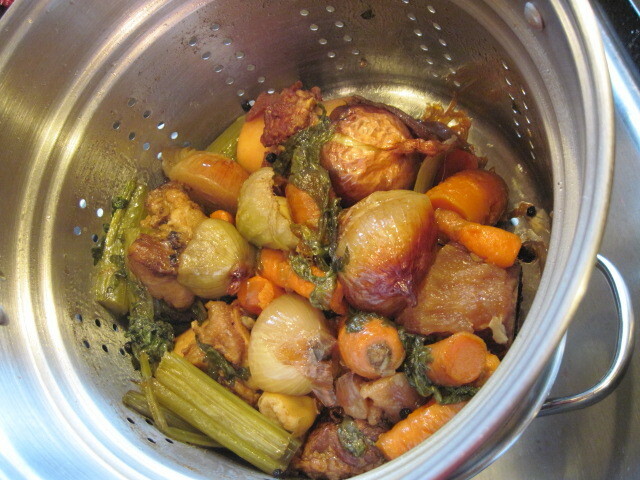 -Leaving the peels on your veggies will give your stock a deeper, richer color and flavor. When your stock has simmered and all your ingredients are withered and reduced, strain your stock and discard everything but the broth. -You’re now ready to transfer your stock to storage containers or use immediately. This stock freezes beautifully. 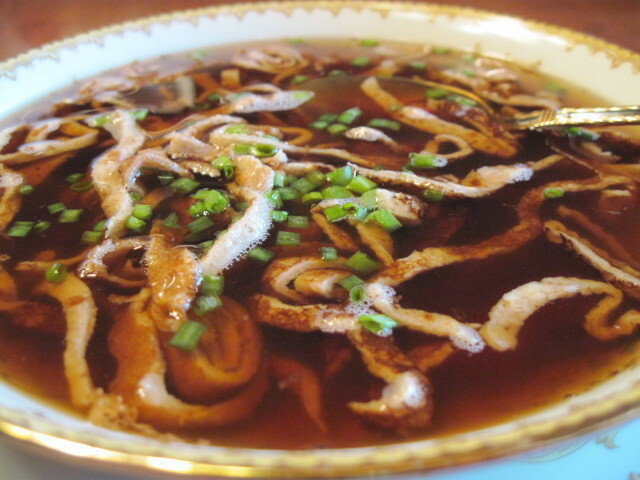 I made mine in advance of making my Fladlesuppe so I froze my stock until I was ready to prepare the completed dish. Soup’s on! Come and get it!!!! Blessed To Do What I Love! 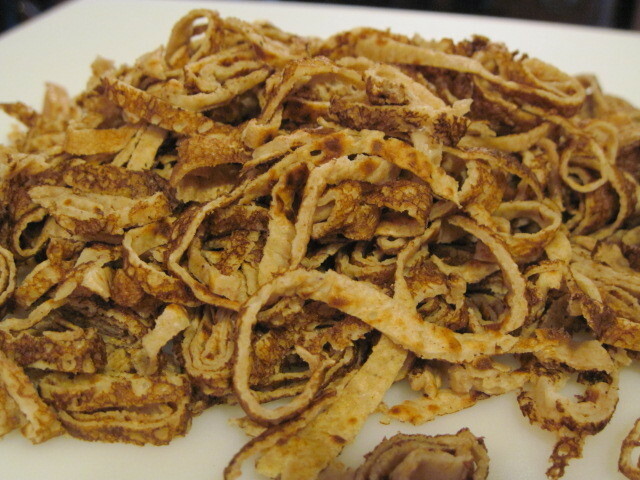 My mother used to make her own egg noodles for chicken soup, this way (different recipe, unflavored). Really takes me back! 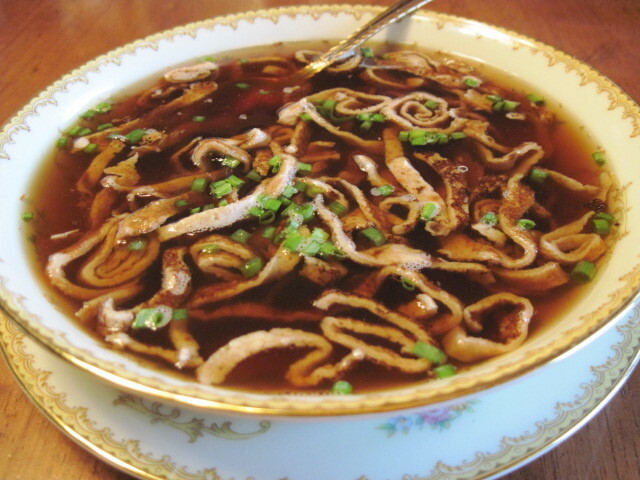 What a nice rich broth and a fun soup. Bet it's wonderful! WOW. That looks fantastically delicious! What an interesting soup you have shared with us. 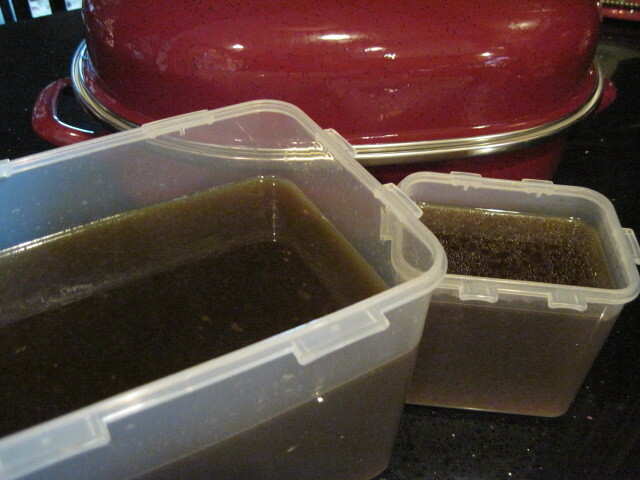 Your beef stock looks delicious. Wow, now this is completely new to me. Sounds very good. Stumbled! I have never seen anything like this. New to me and love it! 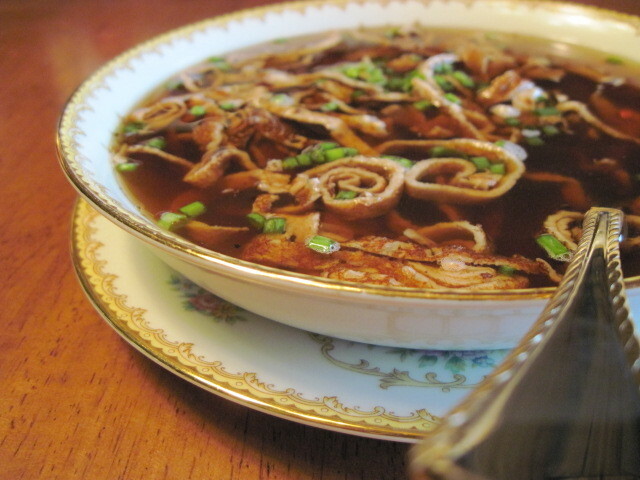 Love the strips of pancake and rich deep broth. Great post! I have always left the peels on some of my vegetables but never the onions, interesting stock recipe, I am going to give it a go. I am almost out of stock supply. And that soup, yum! Thanks for your recipe and tips! I've never heard of this soup before! It sounds so interesting! Wow! That soup looks so delicious. I'm sure it's something my grandmother, whose parents both hailed from Germany, would love. I plan to make it for her for one of my next family dinners. Thanks for posting it.